Whittles Publishing is delighted to announce that Airborne and Terrestrial Laser Scanning has been awarded the Karl Kraus Medal by the ISPRS with the presentation being made on 31st August at the XXII Congress in Melbourne. We are also very pleased for all the authors who have contributed to the book and especially to George Vosselman and Hans-Gerd Maas for their commitment and expertise which has resulted in such an acclaimed and highly successful book. It is gratifying that our growing list of geomatics titles continues to receive recognition and we are endeavouring to create more books that will be equally well-received and useful. Written by a team of international experts, this book provides a comprehensive overview of the major applications of airborne and terrestrial laser scanning. The book focuses on principles and methods and presents an integrated treatment of airborne and terrestrial laser scanning technology. 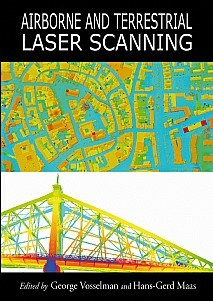 Laser scanning is a relatively young 3D measurement technique offering much potential in the acquisition of precise and reliable 3D geodata and object geometries. However, there are many terrestrial and airborne scanners on the market, accompanied by numerous software packages that handle data acquisition, processing and visualization, yet existing knowledge is fragmented over a wide variety of publications, whether printed or electronic. This book brings together the various facets of the subject in a coherent text that will be relevant for advanced students, academics and practitioners. After consideration of the technology and processing methods, the book turns to applications. The primary use thus far has been the extraction of digital terrain models from airborne laser scanning data, but many other applications are considered including engineering, forestry, cultural heritage, extraction of 3D building models and mobile mapping. Building Extraction (Claus Brenner, Leibnitz Universität Hannover, Germany). Mobile Mapping (Hansjörg Kutterer, Leibniz Universität Hannover, Germany). This will be a benchmark text for advanced students, academics, researchers and practitioners in geomatics in general and remote sensing, photogrammetry and surveying in particular. It will also be a useful reference for companies developing laser scanners and associated software, and scientists and engineers in related disciplines where the technique may be applied.